Right. The eggplant, peppers, and tomatoes are coming in fast and furious. This, I know, is a problem a lot of people would like to have. But when you've harvested 10 pounds of eggplant in less than three weeks, and turned a third of that into freezable baba ganoush, and you're still looking at lots of eggplant coming in, you need some ideas. Caponata is a popular choice. But I dislike olives and capers, and neither of them grow in my garden. Imam biyaldi is my choice for addressing the eggplant glut. I like it because it can be made in two stages, plus it pretty much uses up all the garden ingredients I need to be using up right at the moment, chili peppers, tomatoes and eggplant being chief among them. In fact, this is very much a harvest meal, since everything but the spices and olive oil can be grown in the backyard. It also easily scales up or down to feed however many people you need to. Imam biyaldi is a Turkish dish that translates as "the holy man swooned." The implication is that the dish is so rapturously delicious that it can make you faint with delight. If you survey the top google returns for Imam biyaldi, you'll see that the basic idea is a filling of onions, tomato, possibly pepper - all cooked in olive oil seasoned with paprika and sometimes with either cumin or dill. I'm firmly in the paprika and cumin camp. Rarely you'll find a version that calls for the addition of either ground beef or ground lamb. There are many, many different ways of putting these ingredients together. The filling benefits from sitting in the fridge for a day, if you're into advanced planning. It's also good as a topping for many other things, so I usually make extra. For two servings I start with 1 medium onion, a large tomato, good sized long and skinny eggplant, and a small chili pepper. But I encourage you to play around with the ratios of the ingredients. You'll find it hard to go wrong. Small dice the onion and saute it in plenty of olive oil in a skillet over medium heat. Mince the garlic and add it to the onion after a few minutes. Add the seasonings and the extra eggplant for the filling. Make sure there's enough olive oil in the pan to keep everything coated. 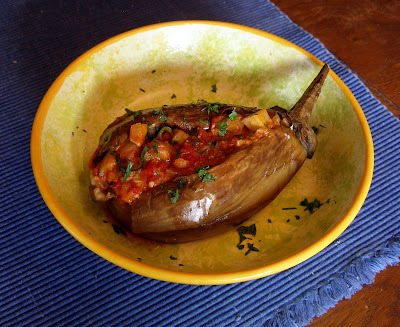 When the eggplant is well coated and begins to cook a bit, add the diced tomato and finely diced pepper. Turn up the heat to medium-high. Cook for a few minutes to reduce the liquid. Taste the filling and adjust the seasonings. You'll need one small to medium sized globe eggplant for each person you plan to feed. Leave the stem intact, but trim away most of the green cap. 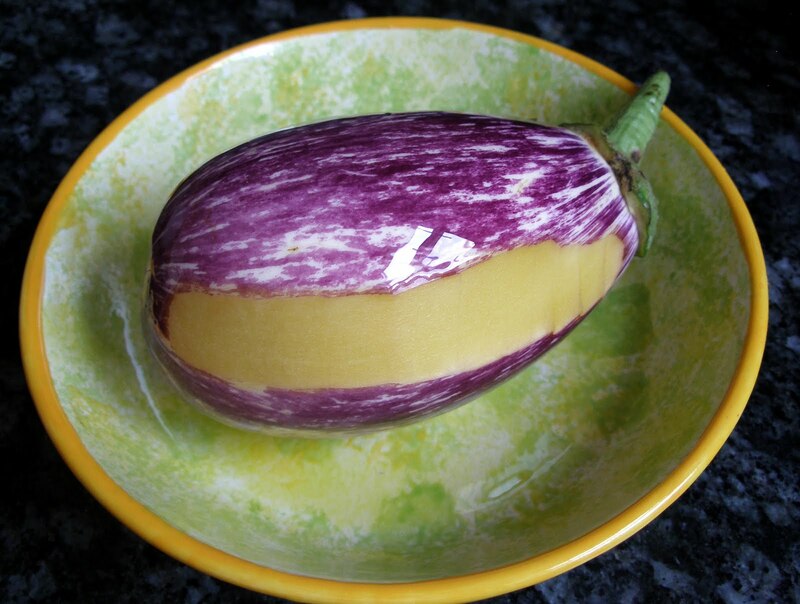 Peel off three long strips of the skin, spaced evenly around the circumference of the eggplant. Place them in a roasting pan and pour over enough olive oil to coat. Rub the olive oil thoroughly into the exposed flesh and completely coat the remaining skin of each eggplant. Sprinkle kosher salt over the dish. Cover with a lid or aluminum foil and bake in a 350 F oven for 45 minutes to an hour. The eggplants should be somewhat softened, but not collapsing or too mushy. Remove them from the oven, uncover them, and let them cool just until you can handle them. They should still be quite warm. Make a pocket opening in each eggplant. Lay an eggplant on its side and cut a slit lengthwise, starting 1/4" from the cap and stopping 1/4" from the blossom end, but do not cut deep enough to cut through the bottom. Push the stem end and the blossom end gently together to open up the inside of the eggplant. Carefully scoop out a small amount of the flesh, in the center to enlarge the opening. Chop the removed flesh roughly, and mix it into the filling. Sprinkle the cavity with a little salt. Put a generous amount of filling inside each eggplant, and arrange them nicely on a platter. Squeeze a little lemon juice over all the eggplants, and top with finely chopped parsley. At this point you could serve immediately, chill the Imam biyaldi for later consumption, or put them back in the oven if you wish to serve them very hot. I've seen this served once or twice with a garlic-mint yogurt sauce. If this appeals to you, it's as simple as can be. Very finely mince a clove of garlic and mix it into a bowl of plain whole milk yogurt. Stir in either dried or finely chopped fresh mint and a good pinch of salt. The flavors will become stronger over a few hours. Keep this chilled, whatever temperature you plan to serve the Imam biyaldi at. P.S. I once read a menu in Europe which presented this dish as "Imam van Biyaldi." Clearly the proprietor interpreted "biyaldi" as the imam's proper name. I had a good laugh over that one. Interesting recipe. I have one eggplant that my daughter planted. I can't believe it survived. If it actually produces, I'll need an idea of what to cook. Thanks for all your great recipes. You're killing me here. I had barely enough cherry tomatoes to add to a salad of storebought greens last night. I can only dream of Imam Biyaldi -- but I probably will. Yeah the eggplant is edible but why would you? little taste, little food value and unpalatable no matter how it is prepared. Substitute a nice large tomato in this recipe and it would taste great. YUM! I've got a ton of tomatoes and peppers and we just returned from vacation to find the eggplant have outdone themselves and I've got a bunch that need used soon. teekaroo, that's a good method for testing out new varieties in the garden - plant something random, with low expectations, and see what survives. Hope you get a few eggplants. Tamar, never fear. Your ship will come in eventually if you've got tomatoes and eggplant. Well bless your heart, sunshine. Judy, that's about where I was two weeks ago. Absences from the garden in summer can create a real crisis for those who don't want anything going to waste. meemsnyc, :) Hope you like it if you try it. How is the turkey doing? I made some braised aubergine last week we practically fought over. Fried sticks of it a little, then added some white miso, 'coins' of ginger + some grated garlic, red chilli, water to cover, simmered for 20-30. Amazingly delicious for so few ingredients. I'm no cook, and this probably won't help much, but my late Great Grandmother used to cook up the most wonderful eggplant casserole. It's what turned me on to eggplant. I don't know the recipe or even which family member might have it. It called for rolling the eggplant pieces in crackers. I'm guessing it might be a similar recipe to scalloped corn. It's nothing fancy, but it really takes the edge off the bitterness eggplant can have. Oh that is a lot of eggplant, you lucky thing. I was flicking through a Sri Lankan recipe book yesterday, and there were a lot of recipes that had eggplant- so many delicious ones to be had. I love them! Robin, I did that last year. Pretty decadent in the midst of winter! Paula, it's doing fine. Taller than the chickens now, but not as heavy. Guess I should do an update, no? curlywurlyfi, that sounds delish! May have to give that a go if we can get another batch together. There's also a Thai recipe I want to try. John, I wonder, was she breading them with cracker crumbs and then baking or frying them? I'd guess she needed egg to make the crumbs stick to the eggplant. Maybe your taste is different than mine, or maybe my varieties of eggplant are different, or maybe I pick them younger - but I never perceive eggplant as bitter. cityhippyfarmgirl, thanks for the tip. I'll have a look at Sri Lankan fare next time I'm hard up for eggplant ideas.